There are a few recent clips on youtube where Phil is promoting the guitar strings, and he sure looks healthy and happy. There's also what might be the last "new" recording of him we will hear. I saw the EBs on their 1984 Reunion tour.. Nov 9th, 1984 at the Cornwall Coliseum, Carlyon Bay, St. Austell. (Was living and working in England at the time.) Was a great show! They were amazing. Still have my stub and program. It's going to take me a long time to get over Phil's death. The Everlys music just speaks to me in way most other stuff doesn't. And the great thing is, there's so much of it. I have maybe 10-15 of their albums, and that's only scratching the surface. The Rhino 4-CD box set Heartaches & Harmonies is a quite comprehensive anthology, but there are a lot of essentials tracks that couldn't be squeezed in. And even in the 20 or so years since it out, there have been several releases of unheard demos and alternate takes. I have the feeling there's a lot of Everly music that we still have yet to hear, which is sure for the best. As one of the articles after Phil's passing pointed out, the quality of their work - even on albums, where a lot of their contemporaries were found lacking - is extraordinarily consistent, right into the era after their reunion. I was out of the country when Phil died, and his passing shook me. Not least, because though born in Chicago and raised in Iowa, his (and Don's) Kentucky roots ran so deep, spiritually, that their music always makes me proud I was born in that state. I saw them perform at the Kentucky State Fair in Louisville in 1985. It was the closest they had come to their parents' hometown of Central City since they got back together and I heard that close to a hundred of their kinfolk came up for it and were in the front rows. "It's sure good to see your faces after so long," said Don between songs. Easily among the three or four greatest shows I ever witnessed. One thing that came to mind was that the Everlys never did get the Kennedy Center Honors treatment. There's no doubt that Dylan, Brian and Sir Paul, to mention three such honorees, would say they deserved to be among that number. Definitely! I thought it was very nice when Little Richard showed up to honor Chuck Berry a dozen or so years ago - still waiting for the roles to be reversed. Crowell read a letter from Don, who did not attend, with his first extensive public comment on his brother’s death. “I’m sorry I can’t be there in person,” Everly wrote, “and really appreciate the recognition. Right now, I’m mourning the loss of my little brother and suffering from a broken heart. His death has saddened me profoundly. I love him very much. He will always be missed. "Everly Brothers' Song Sales Up 696 Percent Following Phil Everly's Death"
Today is Don's birthday. But as you can see at the message below that was posted in the Facebook-group, it's not a happy day. to post this on our Everly Group site! Please NO Birthday Wishes for Don Everly's Birthday ! So much was written about the bitterness, feuding, etc between Don and Phil - IMO blown out of proportion, I mean YOU trying singing into one microphone with your brother night after night for several decades - but it's obvious now that Don truly, deeply loved his brother. Let's keep thinking positive thoughts, healing thoughts for Don, send some prayers his way. The COPD Foundation would like to express our heartfelt condolences to Patti Everly and her family on the loss of her husband, Phil Everly. We are grateful to them for extending his legacy by making a commitment to support our efforts to eradicate this disease. We are motivated by their support to continue to make progress through research to ultimately find a cure for COPD, so individuals such as Phil will not have to suffer. Phil passed away Friday, January 3, 2014 in Burbank, Calif. at the age of 74 due to complications from COPD. The Everly family would like contributions to be made in memory of Phil to the COPD Foundation, to help us fight this terrible disease. According to the LATimes.com, Phil Everly and his brother Don made up the most revered vocal duo of the rock-music era, their exquisite harmonies profoundly influencing the Beatles, the Beach Boys, the Byrds and countless younger-generation rock, folk and country singers. Phil Everly was born in Chicago, IL on January 19, 1939, but grew up in Iowa. He began singing country music with his brother in 1945 on his family's radio show in Shenandoah, Iowa. Notable songs of the Everly Brothers was "Cathy's Clown", "Wake up Little Susie", "Bye Bye Love", "When Will I Be Loved", and "All I Have to Do is Dream". The Everly Brothers were inducted into the Rock 'n' Roll Hall of Fame in 1986, and were known for mixing rock 'n' roll music with country music. Phil Everly last performed in public in 2011, but his son Jason said he had been actively writing songs, living part of the year in Burbank and the rest in Nashville. He said his father had been in the hospital for about two weeks when he passed away. Though the COPD caused by smoking affected his health, Jason Everly said it never affected his voice. Everly married his third wife Patti (current wife) in 1999. His 2 children are from previous marriages. The Everly family thanks you for your support in memory of their angel. 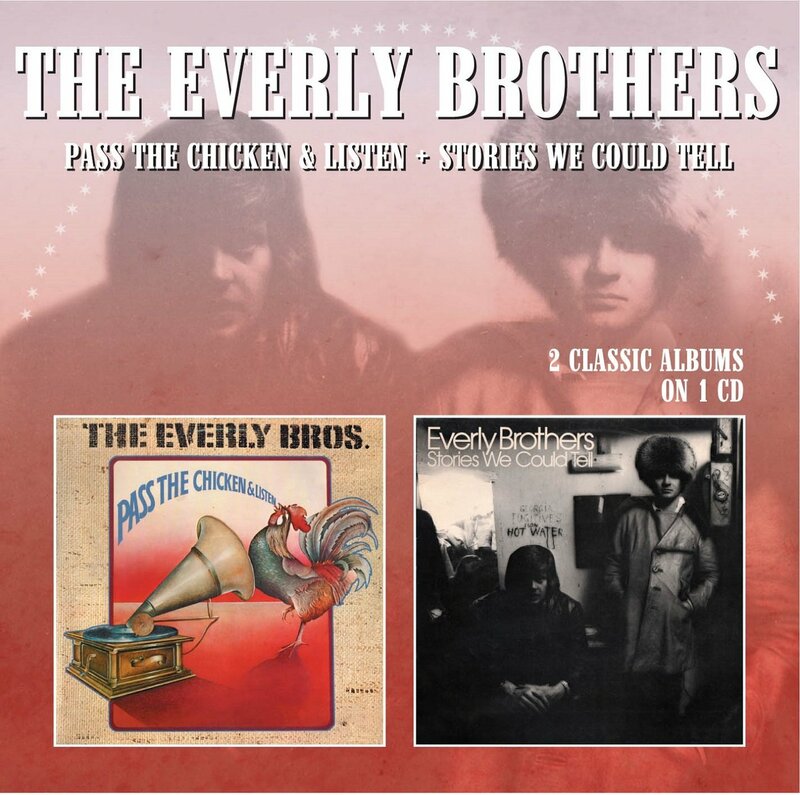 Pass the Chicken is a fine album - IMHO better than Stories We Could Tell. I saw a few interviews of Phil from the later years where they asked him if he and Don would make another album, and Phil said "there were a lot of them that nobody bought" so he didn't feel any burning desire to add to the legacy. Did I mention the nice everly bio that TNN did a few years back? I found it on YOUTUBE in it's entirety. See it if you haven't. A lot of Don interview and reflection. Also family history and a lot of background. There were a couple of those that aired pretty close together. The other one might have been on A&E, and both brothers were interviewed for that one. In one of them, Don came across as mostly bitter about how their career turned out, seemed very serious, didn't smile; in the other one, he is laughing and smiling, and seems more at ease about things. Maybe he was "the moody one". Phil always seems pretty easy going anytime I've seen him interviewed, including a couple videos from the last year or two. Stories We Could Tell seemed to get more attention in the press, but I actually like Pass the Chicken and Listen better. Glad they are available again. Been listening to the Evs a lot lately. It's such a large catalog, always more to discover. Lately, I've been playing their solo records. I especially enjoy hearing Phil's solo albums, it was so rare to hear him sing solo when they were together. Powered by SMF 1.1.21 | SMF © 2015, Simple Machines Page created in 0.519 seconds with 21 queries.